One increasingly common question I hear from prospective tenants is, "Do you report our payments to the credit bureau?" Sometimes this question is asked because the tenants are interested in building a good credit rating. Other times, the tenants don't want you to report because they are used to enjoying the benefits of paying the rent late without any derogatory feedback on their credit report. We have found that when a prospective tenant is warned that the landlord reports positive and negative information affecting the tenant's credit, the rent becomes a priority. We let all applicants know that if they value their good or clean credit, they must make the rent a top priority. We ask the tenant not to sign a lease with us unless he or she is absolutely sure that paying the rent in a timely manner will be no problem. We tell him that we would not want to see him ruin his excellent credit standing and damage his future creditworthiness when it comes to applying for a mortgage or other credit. Once a tenant knows that his own actions will determine what information will go on his permanent record, the importance of paying the rent and honoring the agreement will be seen in a whole new light. upkeep of the rental and the tenants overall performance. 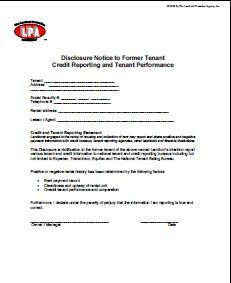 I prefer to discover tenant problems before actually signing the lease, so that's why I show them the Credit Reporting Disclosure Notice when I begin our lease signing session. A quality tenant normally sees it as an opportunity to maintain a great rent record. On the other hand, a slow paying tenant might voice some objections at that point. I learned that the easiest and cheapest eviction is the one when the tenants never get possession of your property! I hope this form helps you keep your tenants paying on time or early!